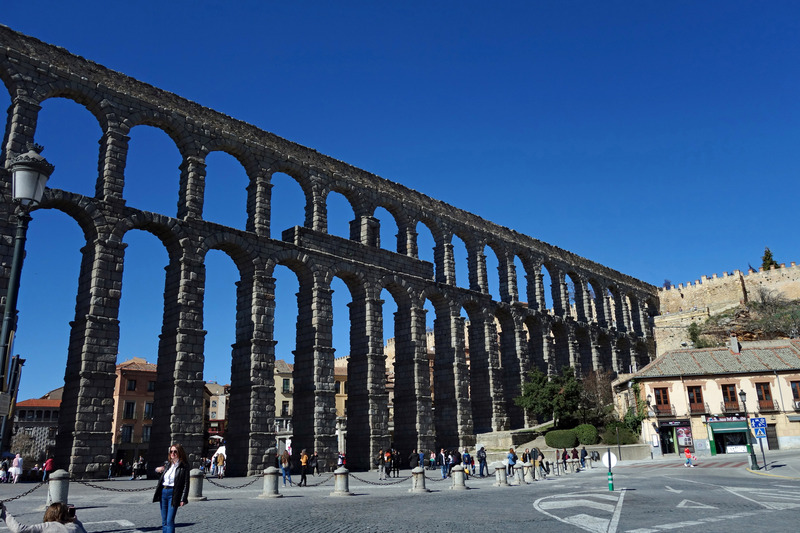 The Aqueduct of Segovia is one of the best preserved elevated aqueducts, considered one of the Roman Empire’s most impressive works of engineering. It was built at the end of the 1st century and in use until the middle of the 19th century. The 166 granite stone arches are set without cement or mortar, purely built on the balancing forces of the stones, many of which weigh close to 2,000 lbs. 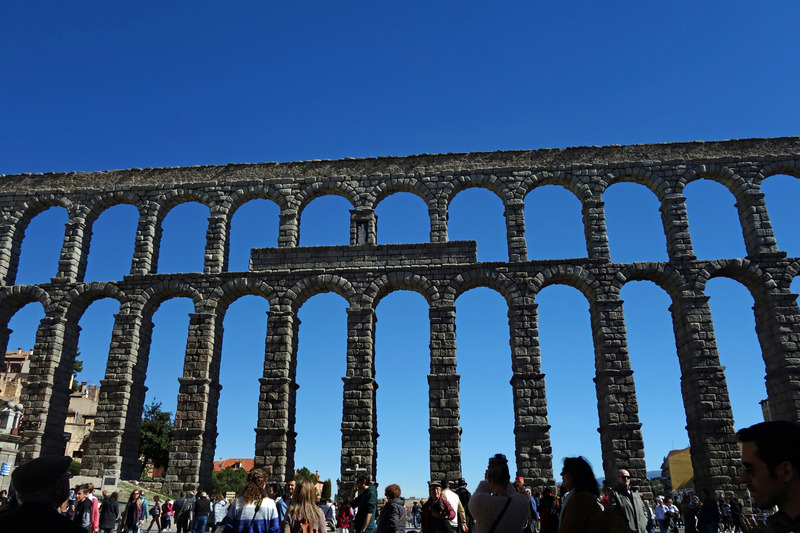 The aqueduct is 14 km long but the most impressive section is where it comes into central Segovia. Being up close to the pillars it was hard to imagine how such a massive project was completed in the 1st century with such perfection that it stands to this day. It’s so tall I can’t believe it doesn’t fall over!!! 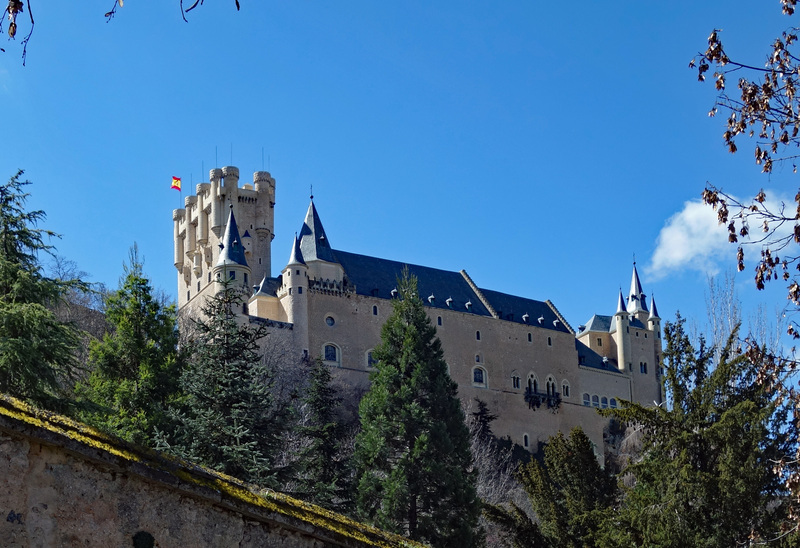 The Alcazar of Segovia is a fairytale castle and rumor has it that Walt Disney used this castle as his inspiration for the design of the Cinderella Castle at Disney World…..can you see the resemblance?? Arriving in Madrid left us feeling sad that our tour of the Iberian Peninsula was over. We returned our Renault vehicle and bid farewell to car #2 in Europe as we prepare to leave the Schengen zone. It is hard to believe we landed in Barcelona on December 21st and have been traveling the outer edges of Spain and Portugal until now. 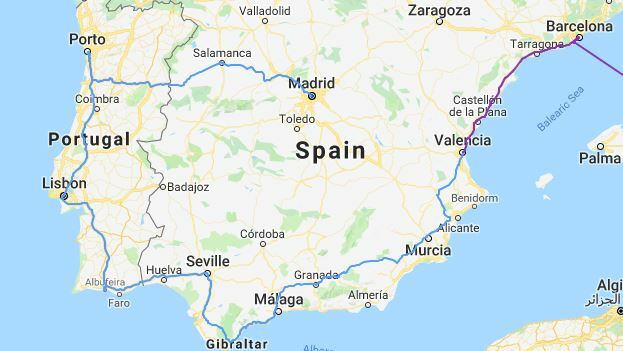 Our travel map below shows our journey around Spain/Portugal, there are so many places we have missed. We only put 4,450 km on the car this go round but the past 83 days have flown by. So, why Madrid when we dislike large cities? 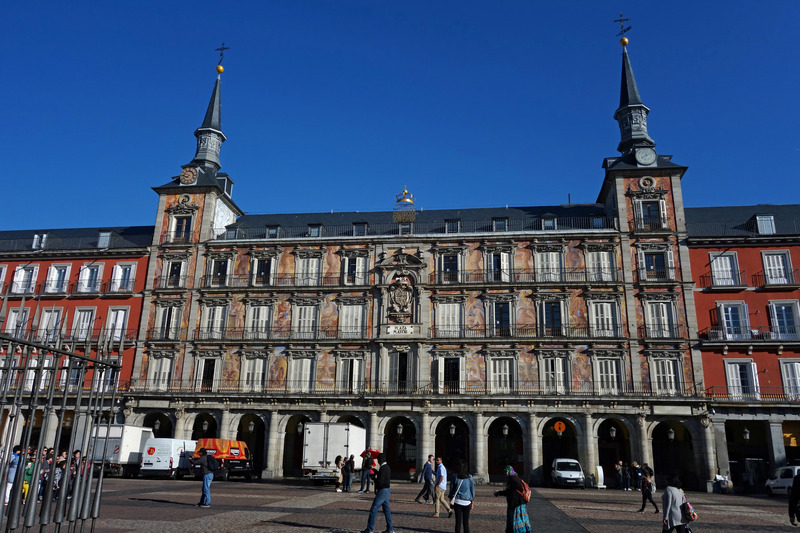 Our flight to Croatia is leaving from here so we decided that the city deserved at least a couple of days of our time 🙂 After giving up our car we took a taxi to central Madrid where we rented an apartment just 100 ft from Plaza Mayor. Being in the middle of the city gives us the flexibility to walk everywhere. We have also found during our European travels that staying in a city center means old buildings which generally means there is construction nearby. In this case, it was right outside our door 🙁 Beginning at 8am and finishing at 6pm there was jackhammering, welding and various other loud banging and crashing. Navigating the 3 flights of stairs to get in and out of the building was an exercise in avoiding debris and stepping around construction materials. Not a perfect place to stay! Inside the apartment was brand new and fully renovated and would have been lovely except for the construction dust which permeated every corner, fortunately this was a brief 3 night stay. We booked a free walking tour with Sandeman Tours who we used previously in Edinburgh, Scotland and find them very good. Our guide was a transplanted Manchester, UK gal whose university degree is in Spanish and Portuguese history so she was a wealth of historical information regarding Madrid and many other parts of Spain. We learned a great deal about Spanish and Madrid specific history, it was a fun tour and we tipped her well for her efforts. A recommendation she did pass on was her favorite place to see a flamenco show, after sharing the true origins of flamenco it compelled us to want to see a live show, the history is fascinating and not what most people believe. We bought tickets and were going to our first flamenco show, on our penultimate evening in Spain. Nothing like leaving it until the last minute!!! And how was it? Interesting but not something we would go out of our way to see again. The venue was small, crowded with tour groups and we did not have good views to the stage which meant we could not see the footwork, and that is what you want to watch during the performance. The dancers were amazing and very talented so a better view would have been nicer. Click here for a more detailed history of flamenco. Plaza Mayor in Madrid is nothing like any other city we have been, here it is definitely NOT the place locals come to socialize. This plaza is filled with homeless people building cardboard shelters every night, beggars, touristy restaurants and bars, and full of delivery trucks in the mornings…not a great place to hang out and this fact was confirmed by our walking tour guide. She made it quite clear we should not spend time there while in Madrid. Outside the plaza the streets are filled with shops, cafes, bakeries, restaurants and bars catering to locals and tourists alike with a much more authentic feel. 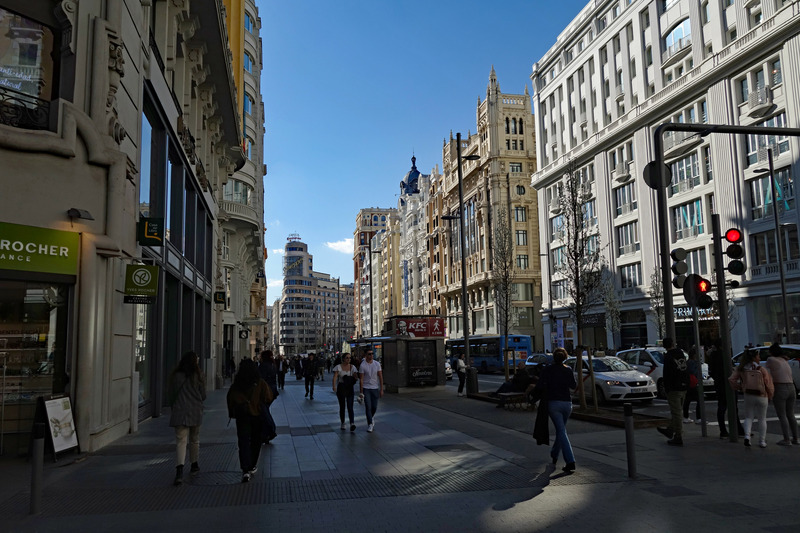 Calle Gran Via is a hustling and bustling part of Madrid, known as the city’s very own Broadway. Besides theaters, a casino, endless bars and restaurants, the street is filled with high fashion brand name shops. Pretty much everything you could want to do or buy can be found here, it was here we found the New Balance store for Blair to replace his very worn out running shoes. When you only have room for 3 pairs of shoes they deteriorate very quickly, wearing them almost every day. The architecture on Gran Via is truly magnificent and worth taking a walk down this very popular street, which we did a couple of times. Be sure to look up for some amazing views! 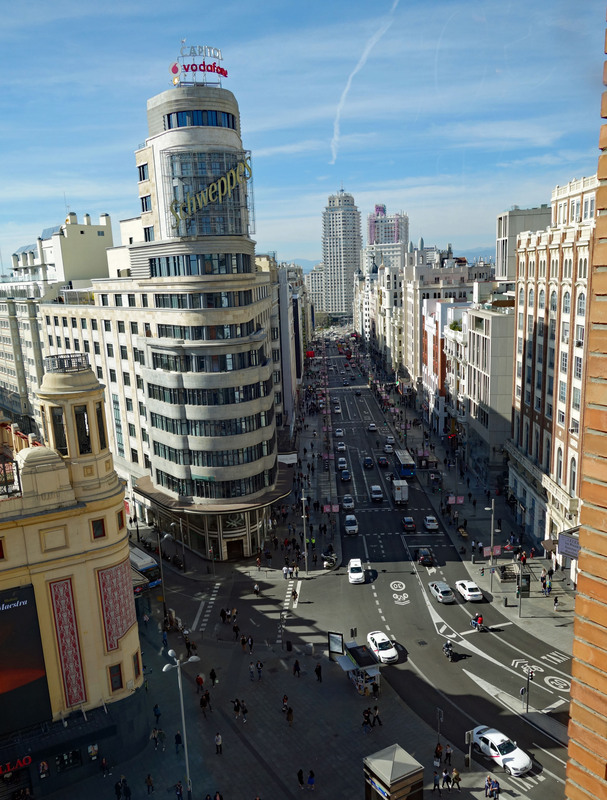 We read online that the El Corte Ingles department store had a terrace on the 9th floor of their building, so off we went to get a birds eye view of Madrid. 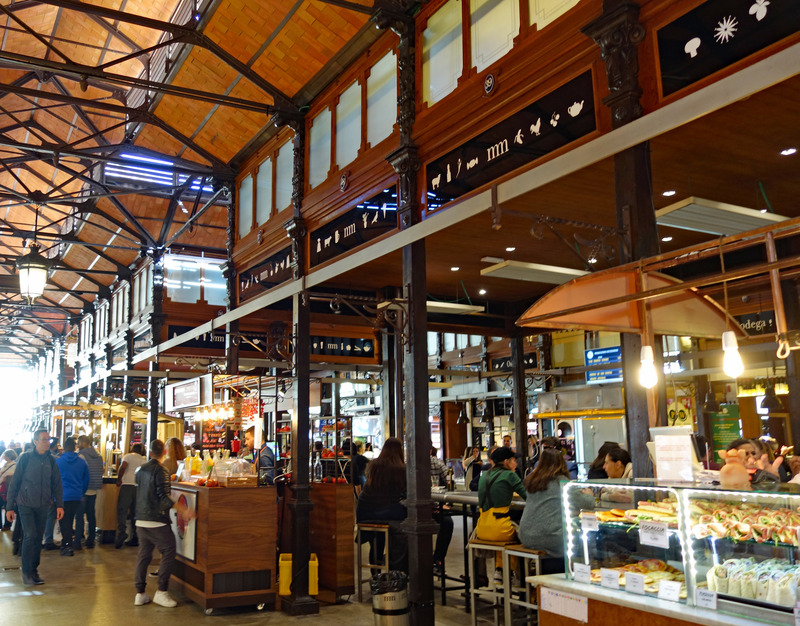 Not only do they have a terrace but it is a top end food court and market. We took a break from our walk and while I enjoyed a glass of Tinto de Verano, Blair, as per usual, had a glass of the local beer, Mahou. Our tour guide told us Sangria was for tourists and Tinto de Verano was what the locals ordered, they actually look the same when served, and tasted much the same to me anyway. 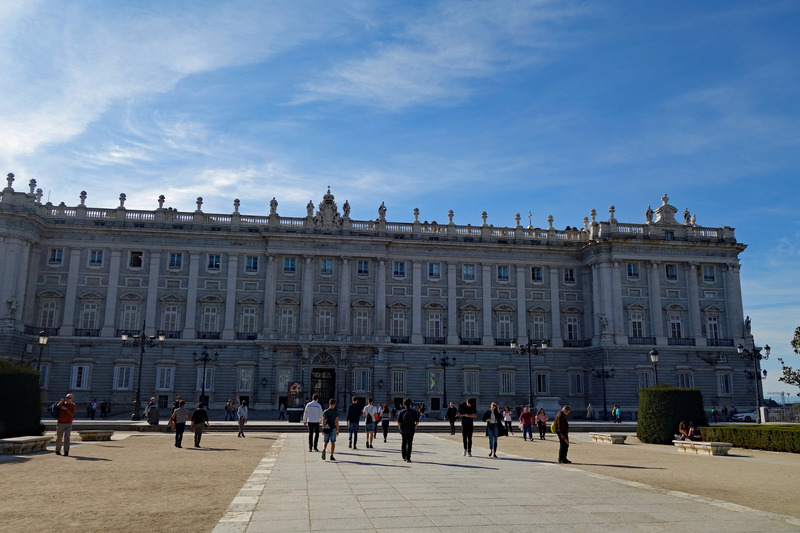 In the early 1700’s Madrid’s Alcazar was destroyed by fire and rebuilt by then King Philip V, who was the first member of the French House of Bourbon to rule as King of Spain. 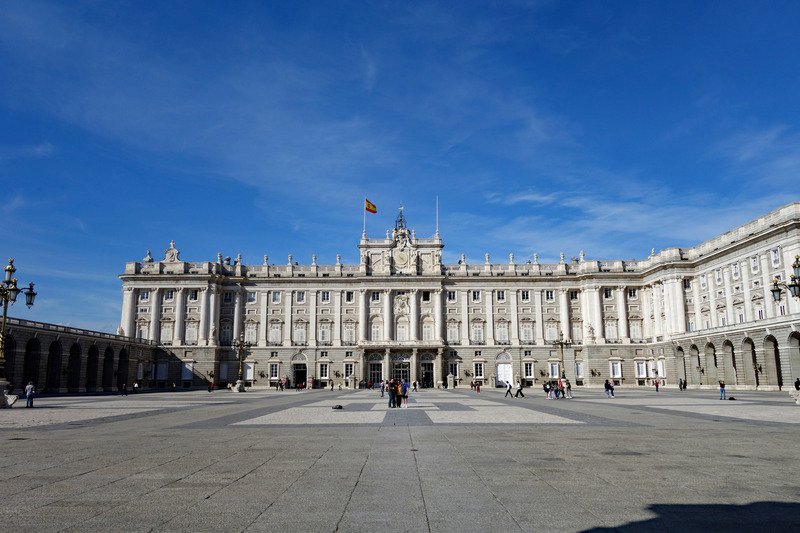 Philip was born in the Palace of Versailles and when the Alcazar in Madrid burned down, under suspicious circumstances, he replaced it with the current Palacio Real. This magnificent palace looks like it could have been transplanted from Versailles. 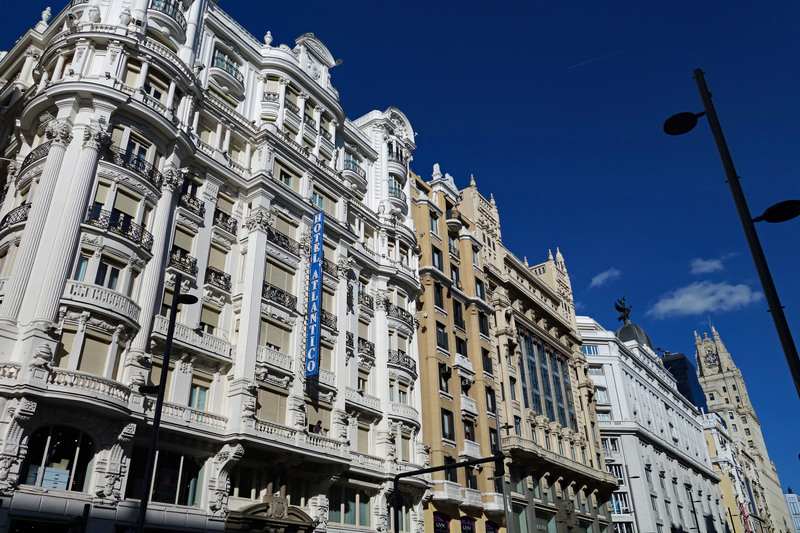 Philip’s influence on the architecture around this area of Madrid is evident with many of the buildings designed in French taste. 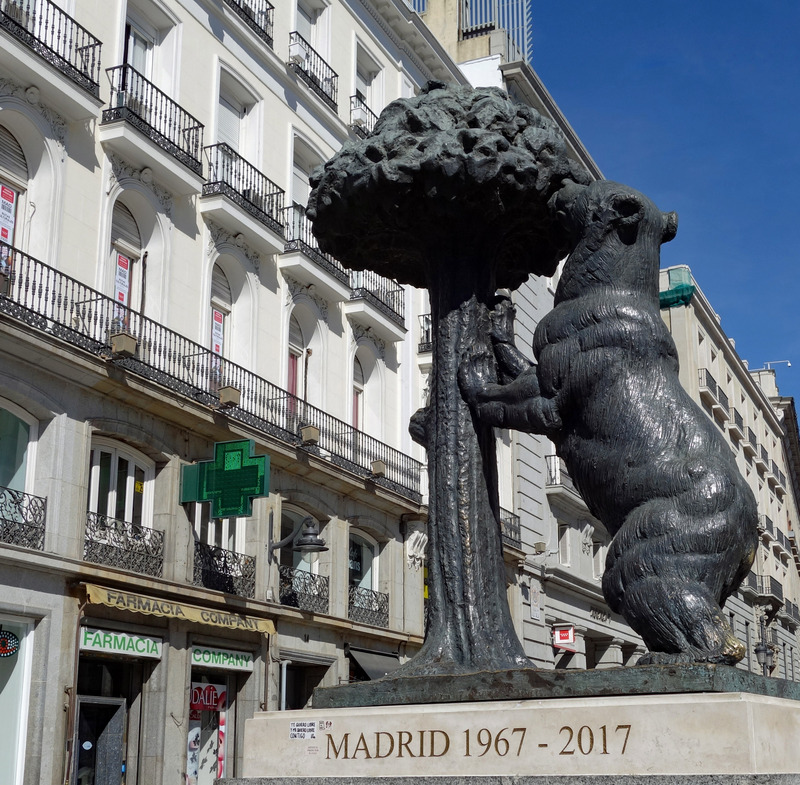 The statue of the Bear and the Strawberry Tree is a sculpture from the 20th century located in the plaza of Puerta del Sol. It is the official city crest of Madrid, and can be seen on everything from manhole covers to the logo for one of Madrid’s two football clubs. Madrid surprised us with the friendly and genuinely helpful locals, which is not something we expected from the largest city in Spain. The residents here spoke more English than all the other cites we visited in Spain, which naturally makes life for us a lot easier. Outside the old city center area the streets are wide with an abundance of beautiful architecture and parks which would have been great to visit had we more time here. For anyone coming to Madrid, be sure to get out of the old historic center, this city has a lot more to offer. And so, 2 days in Madrid ends our tour of Portugal and Spain. While we have enjoyed both countries tremendously and seen many amazing places along the way, Portugal has taken a small piece of our hearts and we hope to return for a longer stay to explore this wonderful country in more depth. Until then, we leave the Schengen Zone for a country we have never been to and comes highly recommended by fellow nomads, Croatia…..
Head to this link where you need to pre-book your free tour with Sandemans. Our guide was Lexi and we highly recommend her, she is funny and very informative.